Unwind in the world famous tranquil beauty of the Colne Valley, north Essex in the privacy of your own private, self-catered holiday lodge complete with the ultimate in luxury: your own hot tub Jacuzzi. Tucked away on your own private veranda your own private elite hot tub offers both seclusion and a view of the delightful countryside. Treat yourself to a glass of champagne, soothe your muscles, lay back and relax in style. Fast to heat and with multiple settings you can make your stay as soothing or as steamy as you like. Surrounded by 500 acres of private country land. 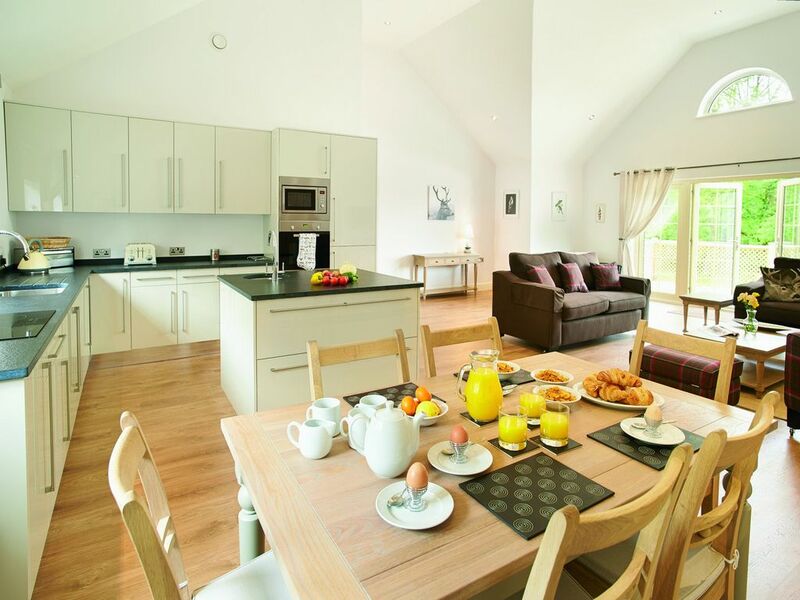 Wakes Hall Lodges offer the ultimate place to escape the city or your hectic lives. Our prestigious self-catered accommodation is the perfect place for a couple or family to spend some quality time together. Our eco-friendly state of the art lodges have recently been built and boast the latest technology as well as high-speed satellite Wi-Fi, a superb quality sound system a superb, fully-equipped kitchen. Our master en-suites have a free standing bath and walk-in waterfall showers. Second bedroom en-suites have a walk-in waterfall shower. The super king sized beds ensure absolute comfort and the hi-tech, super insulated build not only means that your lodge is carbon neutral but also means that you will be lovely and warm throughout your stay. Short breaks available - please contact us for prices. My family have been farming at Wakes Hall for 100 years in the beautiful Colne Valley of North Essex. We have seen over the last 100 years tremendous changes in farming operations. During these dramatic changes farmers have looked at diversification projects, this is where the story begins with our Luxury Holiday Lodges. We have a secret ancient meadow set within the heart of the farm surrounded by woodland and undulating countryside where heavy horses, cattle and sheep would have grazed. The five purpose built Holiday Lodges are situated in the tranquil location which is approached by a private driveway through meadow land and woodland. Each of the Lodges is in the New England style offering high standard of sustainability and energy saving features. As part of our landscaping and infrastructure we have planted over 3,000 trees, created a lake, installed solar panels to assist in the supply of electricity and reinstated a hydraulic ram built in 1886 to help supply fresh water to the lake. Guests can enjoy private walks to take in the abundant wildlife. At the end of the day our objective is simple, to create a place to stay as comfortable if not more comfortable than being at home, all in a peaceful and tranquil environment. Our master en-suites have a free standing bath and walk-in waterfall showers. Second bedroom en-suites have a walk-in waterfall shower. Complimentary luxury toiletries. Induction hob - instructions are supplied if you have not used one before! The kitchen is well equipped with utensils, plates, bowls, cutlery and glasses. A full inventory can be supplied if required. Available a short drive away. Please contact us directly for stays of less than 7 nights as we have standard package rates that apply. Awarded a 5 Star Rating by the AA Self Catering Quality Standard 2017. Little Gem of luxurious relaxation, so peaceful. Our 3rd stay ay Wakes Hall - first stay in Brooke Lodge with dogs. Everything was of the usual high standard of cleanliness that we have previously experienced. The Lodges are well positioned for complete privacy and are well-equipped with some lovely luxurious touches to make you feel spoilt. Very Clean, very modern, very quiet, can't wait to come back again, the Hot Tub made it all the more magical. Made my 50th all the more memorable. Thank you very much, will definitely be coming back again. The lodge was spotless with high quality fixtures and fittings. Loved the fact the decking was enclosed so the dog was safe. Plenty of space to walk. Very very private and quiet. Will definitely be returning! I would highly recommend staying in one of these beautiful lodges they really are a great place to get away from it all. The lodges are fitted out to a high standard and the owner provides you with all the basic that you need to start your stay. The lodges are situated in a lovely area with views of a fishing lake and forest and is a great area if you have dogs. Would definitely return for another stay . Thank you for taking the time to post such a lovely review! The lodges do certainly sit in the most peaceful and scenic spot - perfect for a bit of R & R! We do hope you will be able to visit us again in the near future. Initial impressions were that the lodge was spacious, clean and very well equipped. However on closer inspection the cleaning left much to be desired for a five star property. The cleaning was "superficial" with old food and dust underneath the sofas and some glasses and cutlery had not been cleaned properly. One of the sun loungers was broken and again there were piles of old leaves, rubbish and ants underneath. The outdoor trellis gate at the top of the steps was broken and had sharp exposed staples. The high hair we ordered was not in the lodge on arrival and we had to wait until the second day for it (and a spare key) to arrive. When it did arrive it was in a disgusting state. There was old, mouldy food under the seat and the safety straps were filthy. It has obviously been like that for some time. The welcoming flowers, wine and fruit juice were a lovely touch but more attention to the basics and a better standard of cleaning would have been preferred. Arrived on Friday the 26th of August. There were flies all over the lodge, dead and alive. Kept landing on any food we prepared. We could not enjoy our stay at all and only stayed one night instead of three as they could not give us a solution to the problem. We have tried to be reasonable and suggested going back on another date when the fly issue has been sorted but they have refused this and or to give us some kind of refund. Awful service for the amount paid. Feel so sorry for my fiancé as this was a Christmas present from him. I had been ill for the last three years and this was our first get away since. Just awful treatment. We are just money in the owners eyes and not humans who have worked hard for this get away. 1. I cannot control matters in the countryside when windows and doors are left open. The only prevention would be to arrange for fine mesh screens to be erected on door and window openings. 2. Unfortunately I could not attend on the Saturday morning at the Lodge as I was working in Stowmarket. I left it in the capable hands of Marianne to meet with the clients to discuss the issues. I was in telephone contact with Marianne. It was quite clear that the guests were upset with the volume of flies. 3. They advised Marianne that they wished to leave on Saturday morning and I therefore asked via Marianne that they write putting forward their issues to me so that I could address it on my return. 4. I received the photographs which are posted, I did not consider given the photographs and information provided to me that there had been an epidemic of flies at the Lodge. I wrote to the guests reiterating my disappointment that they did not stay and offered a discount to them should they wish to come and stay again the future. As we are all aware August has been very warm and I believe that there have been more flies than usual, however we have not had an epidemic. Going forward if we find that there are issues with flies with other guests I believe the only way forward will be to put some mesh screen on the doors and windows to prevent flies from getting into the Lodges. AWARDED 5 STARS BY THE AA SELF CATERING RECOGNITION SCHEME! Unwind in the world famous tranquil beauty of the Colne Valley, north Essex in the privacy of your own private, self-catered holiday lodge complete with the ultimate in luxury: your own hot tub Jacuzzi. Tucked away on your own private veranda your own private elite hot tub offers both seclusion and a view of the delightful countryside. Treat yourself to a glass of champagne, soothe your muscles, lay back and relax in style. Surrounded by 500 acres of private country land. Wakes Hall Lodges offer the ultimate place to escape the city or your hectic lives. Nature lovers will have a wonderful time taking in the stunning flora and fauna of the delightful countryside. As well as a stunning two acre lake and there are an endless number of woodland walks to explore including the neighbouring willow woodland where the trees are farmed to make cricket bats. Visitors often enjoy a short amble to the local village where there is a shop and post office and a picturesque pub beside the river Colne that serves locally brewed beer. Local beauty salons provide a full range of services for visitors to the lodges and for those looking for an extra special treat we can arrange for a fully trained chef to serve up a delectable feast from the comfort of your lodge. Please refer to Terms & Conditions when booking. Please request prices for less than 7 nights as we have standard package rates.